I surprised myself when I saw that my last blog post was in June! Of course, I do have some excuses: training my replacement at work (takes time), on vacation in the US (saw lots of family and friends) and Italy (relaxed on the beach which you see above in the pictures), and nothing much to report except…I’m working on a new book and the translation by a friend-translator of “Il Molo” into French. I continue to manage three FB pages plus two websites – one for indie authors www.literaryselfies.com, and one for my painter husband www.pierremontant.com. Take a look at both of these if you have a moment. My time constraints will be greatly eased when I (finally) take my retirement at the end of the year. I will have more time to do all of the above plus blogging more frequently and more time to do nothing, if I so choose. Il Molo is waiting for you! Two of the photos that head up my blog page were taken on the beach in Varigotti. One of them shows the boardwalk that leads out to Il Molo. 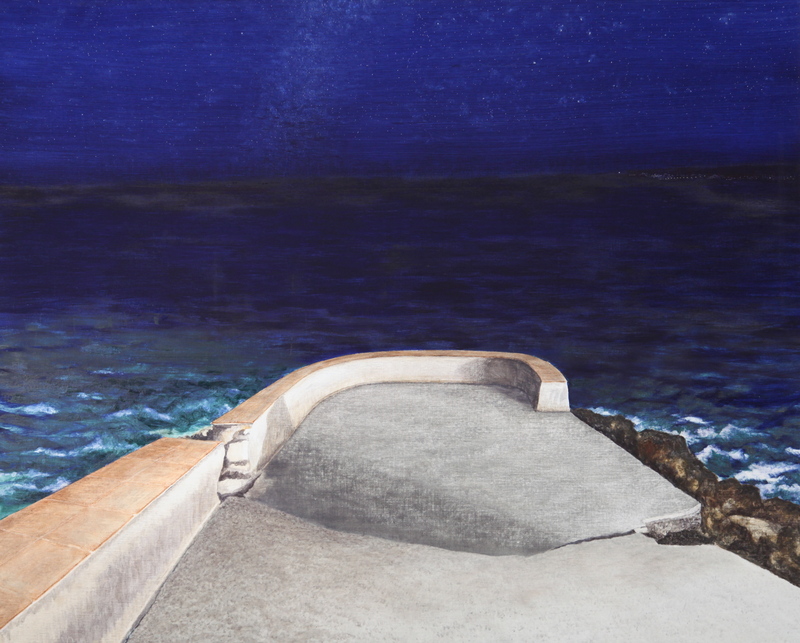 The other one is a view from the top of Punta Crena and is taken from a painting that I used in an earlier post. It is difficult reviewing your own book. I think the most important thing that I can say is that I enjoyed writing it. I started the book in 2010 when I had a brilliant idea about writing a novel about a murder in the small village in Italy where we spend at least a week every summer. But then I stopped working on it – unsure of where to take the story (Italian police procedures, etc.) as well as lack ideas on how to go about convincing an established publisher to agree to publish and distribute my novel. Then in 2013, my aunt self-published her book and introduced me to CreateSpace. So I had my publisher. As for finishing my novel, one day I had a “revelation” and I knew where the story was going. I will not reveal what happens in Il Molo. I will let you discover it. Happy reading! Not too bad for three months. Thanks to all of those who helped make these stats possible. A San Francisco cable car holds 60 people. This blog was viewed about 880 times in 2014. If it were a cable car, it would take about 15 trips to carry that many people. It was after I wrote the introduction below destined for a book on my dream life (still in the works) that I decided to incorporate dreams into Il Molo. “I have had a dream almost every night since I can remember – even when I was a child. I recall a few dreams from childhood, and one in particular that repeated itself at least twice. But given the frequency of my dream episodes now, I imagine my subconscious was just as active then as it is now. My dream subconsciousness is fueled by what I have read, what I have seen on television and the movies, and on the myriad of events that I have experienced. You would think that I was a dull, straight forward person since my chosen career path has been treasury, accounting and finance. I am straight forward but by no means dull. My imagination is quite active and working all the time. I remember my first husband used to say that it was not wise to leave me alone for too long because I thought too much. Il Molo is now also listed on Author Shout’s Cover wall – http://authorshout.com/cover-wall/. I was extremely busy this past week at my day job. I felt like the White Rabbit in Alice in Wonderland. On Thursday morning I realized that the previous day I had had no time to consult my Facebook account. I knew I was missing some important news from my friends. Couldn’t check on how my pages were doing – Literary Selfies, Il Molo, Pierre Montant. Didn’t even have time to check if there were any more FB Likes on Literary Selfies, not to mention time to post a new interview on the blog. And my own blog – no time to see if I had any more followers. Goodreads and She Writes fell off the radar. I didn’t check my sales on CreateSpace and Kindle Publishing nor if I had any more reviews on Amazon. Didn’t look at either Twitter or Pinterest. Google+ never even entered my mind. And Commission Junction was just a fleeting memory. Wow! Now that I’ve listed all the sites that I consult in a day (besides the ones I need for my job) it’s scary. What would I have been doing 10 years ago? For sure none of this. However, I must admit I’m glad that all these internet tools are available. I wouldn’t have been able to self-publish my book and market it myself, create a website and a blog, use social media to reach out to friends and followers. On the other hand I wouldn’t have had dozens of passwords to remember, nor worry about viruses, nor hackers breaking into my accounts. And I definitely wouldn’t have had that “White Rabbit” day. “Loggia cosmica” by Pierre Montant 2001, Oil on canvas, 130 x 162 cm, Private collection. Thanks to my artist husband (Pierre Montant) and the painting’s new owner Il Molo found it’s cover. When I came up with the book’s title I immediately thought of this mysterious oil-on-canvas work that Pierre had completed in 2001. It depicts the pier known as il molo which extends out from the beach in Varigotti, Italy, and, in this particular scene, the damage that can be done by the sea at it’s angriest. The painting captured the exact atmosphere that I was looking for. Pierre said he would be honored to have Il Molo adopt Loggia cosmica as it’s cover. By the time I published the book in 2014 the painting had been purchased, and the new owner graciously agreed to let me use it as the cover. If this painting excites you, you can see more of Pierre’s works on www.pierremontant.com and on YouTube. You can read the salient parts of the Prologue of IL MOLO on BooksGoSocial.com. Discover the Molo and Martha, and get a taste of what is to follow. I hope this will tempt you to read the book or at least put in on your Bucket List.